CAUTION: This software is still test version. 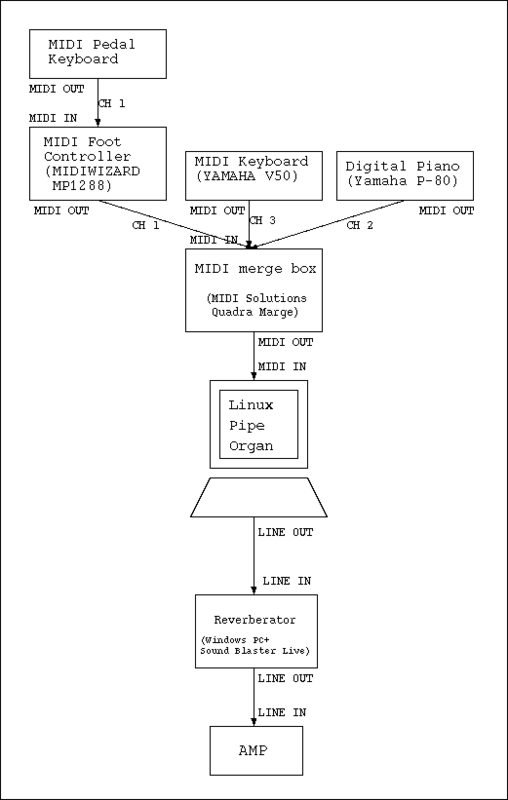 With one or more MIDI keyboards, your PC running Linux works as a digital pipe organ! The purpose of this software is similar with that of SCPOP on Windows. Thanks to the Jeux soundfont by John Wynne McCoy, you can obtain high quality sounds. Allocating a sound into a stop. You can see some pictures in this page. Listen to these MP3 files with your headphones. If you use TiMidity++(a software synthsizer) for the purpose of generating sounds, a powerful CPU is required(at least AthlonXP-1800+). If you use TiMidity++ , the model of soundcard is not a matter. But if you want to purches a new soundcard, Sound Blaster Live! (or Audigy) is a good choice, because reverb effects might available with the card in the future. You can use up to four external MIDI keyboards. You can use VPO without reverb effector, but in this case, the sounds is poor. Most soundfonts are not intended to be used without reverb. I'm using another Windows PC that SBLive is installed as a reverberator. Also, I sometimes use YAMAHA REV-500 reverbrator. You can call stored combination memory by pressing a button on the joystick connected to your PC. I tested this function by using a joystick with ten buttons connected to my PC via USB port. VPO uses joystick device file /dev/js0. By using MIDI foot controller, you can call registration memory by pressing buttons near your feet. I'm using MIDI WIZARD MP1288. Volume pedals can be connected to this, so I'm considering implementing a function of swell pedal. You need to prepare softwares such as GTK+, ALSA driver,TiMidity++ and Jeux soundfont file. For more detail, see below preparation instruction. VPO uses the synthsizer on the SB Live! card or Timidity++ as a way of generating sounds. The former has advantages of easy setup, quick response of sounds, But also has a disadvantage of a limitation of an amount of voices that can speak at a time(Maximum 64 voices). On the other hand, the latter has an advantage that an amount of voices speaking at the same time is limited only by the power of CPU, but also have disadvantage that causes a little timelag between pressing a key and speaking. Install C++ development environment and libraries of ALSA and GNOME. If you are using Ubuntu 8.04, install packages 'g++', 'libasound2-dev', 'gnome-devel'. Download a source archive of VPO. Chenge directory that existing VPO source codes. 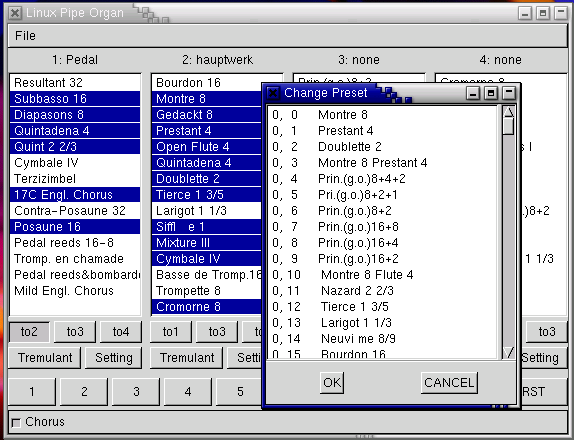 Download Jeux 1.4 soundfont file from here. Put soundfont file into /sf. note:You can change the location of Jeux14.SF2 by modifing initialization file(such as default.tbl). By writing above line into /etc/rc.d/rc.local, this is executed every time of OS booting automatically. Download a source archive of Timidity++ 2.13.2 from the Timidity distribution site. Modify source file of Timidity++ to enable more voice speaking. timidity/timidity.h Line 412: Chane value of MAX_CHANNELS into 64.
and so, you can use. on the directory existing sources and executable file of VPO. Previously you needed to launch Timidity++ first. But now, it is not necessary. By sending program change signal(0 to 9) to VPO, registration memory is called. Channel number is one of 1 to 4. By sending modulation depth signal to VPO, the volume level of the third keyboard is varied. Channel number is one of 1 to 4. This software is NO WARRANTY. 2008/07/21 Updated test version. Several bug fixes, etc. 2008/07/19 Updated test version. The VPO is still alive! Now the VPO can be used under Ubuntu 8.04 LTS. The problem that only bank 0 of Jeux14.sf2 can be used is solved. 2005/02/12 Updated test version. Compilation errors are solved where ALSA-1.0 or above is installed. Now, you cannot use VPO with alsa-0.5. 2003/01/10 Updated test version. Solved compilation errors when compiled with ALSA-0.9 or above. 2002/12/28 Updated test version. Several bugs were removed. Also, the way of discription of spefecication of SoundFont in registration file was changed. Hereby the registration files created older version of VPO cannot read by new version of VPO. I'm sorry. But, it is convenient for exchanging registration files with others. 2002/08/25 Updated test version. Added a function of adjusting pitch. 2002/05/18 Updated test version. Added a function of calling registration memory by using MIDI foot controller. 2002/05/09 Updated test version. The problem below was still remaining.Solved the problem. 2002/03/31 Updated test version. Several problems were solved. 2002/03/24 Updated test version. Solved a problem of remaining sounds when keys are released, if the keyboard sends note-off signals with non-zero velocities. 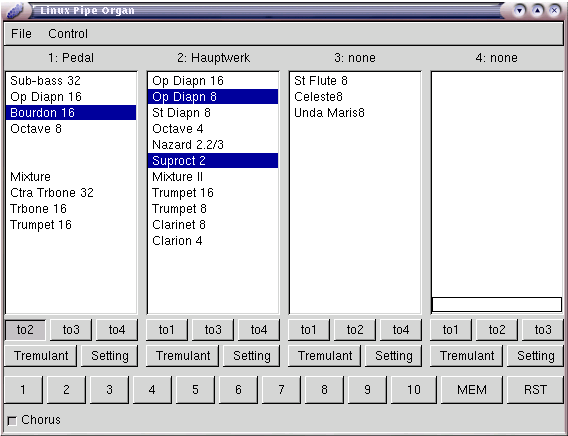 Added "VPO with Viscount Organ". 2002/03/23 Updated test version. Added a function of launching Timidity++,ecasound from VPO, and also added a function of switching Soundfont from VPO. 2002/03/17 Updated test version. Added a function of adjusting chorus level(the amount of shifting pitches of all stops at random). 2001/10/28 Updated test version. Joystick supported. 2001/09/30 Updated test version. Fixed minor bugs. 2001/09/09 Updated test version. Supported ALSA 0.5x. 2001/09/02 Updated test version. Added a chorus function, etc. Fixed minor bugs. 2001/09/16 Opened a page in English.